*This post contains sponsored content and affiliate links. All opinions are my own. Thank you for supporting the brands that make Threads for Thomas possible. Happy Friday friends! Some of you know that fitness plays a large role in my life, so today I'm excited to be sharing one of my favorite workout lines with you! Being a fashion blogger and shopaholic, there are a lot of brands that I love to wear. However, there are only a few that I am passionate about, and one of them is Peach. 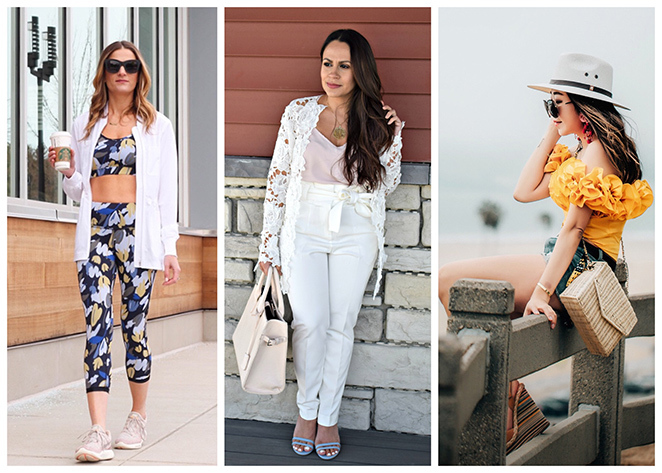 Peach is a contemporary clothing line that will take you from the gym, to work and play, with athleisure apparel being their main focus (you may remember when I last shared about Peach here). After discovering Peach, it has become my go-to for workout clothes for several of reasons. First, and most obvious, the clothes are super cute! Can we talk about this outfit that I'm wearing? I'm loving the floral print for spring, and these leggings are reversible! 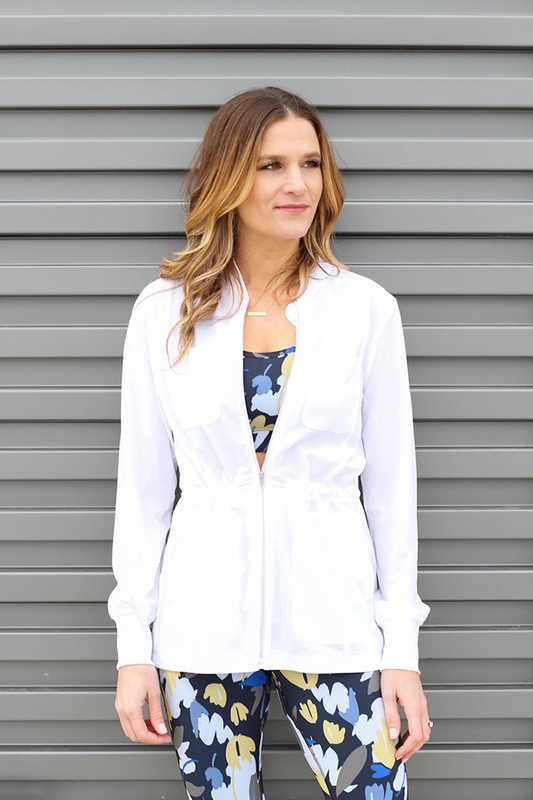 This anorak is so lightweight, and I'll be wearing it with everything this spring and summer. I love that I can throw this outfit on in the morning, drop the twins off at school, have a coffee date with another mom or business meeting, and feel put together all in the clothes that I'll work out in when I return home! The second is the quality. Since most of my mornings are spent in workout wear, I want items that I feel good in, fit well, and that will last. All my clothes from Peach not only wash well, but they stay in place weather I'm doing squats, cardio, or stretching. The third is the business structure of the company. Peach is mainly sold through stylists, allowing women to start their own businesses without a financial risk. (Those who know me, know I'm a huge fan of women running their own businesses!) They support and inspire female entrepreneurs, and in addition to their stylist, they showcase two to three under-discovered female founded accessory brands each season! How cool is that? But it's not just workout wear! Peach also has jackets, the cutest everyday dresses (I just got this one here), and leggings that can take you from day to night. I wear this pair all the time, and no lie, I get compliments EVERY time that I wear them (yes, more than when I wear my Spanx)! Being someone who likes to workout daily, a stay at home mom, and a business owner, Peach fits my everyday life perfectly. And I'm excited to announce that I'm now ambassador for the company!! Make sure to check out the new collection here, and please message me with any questions. 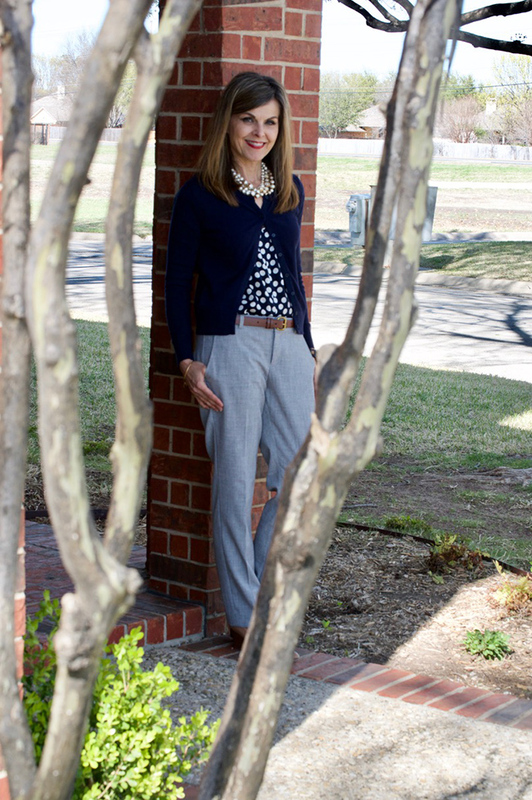 The feature blogger is Carrie of A Stylish Fit. I'm loving how she styled polka dots for the office! Make sure to stop by Carrie's blog and say hello. love, love, love your workout gear! I definitely need to update my workout clothes for spring and summer! Great work out gear! Happy Easter! Fantastic print for a great look! This set is stunning and you look amazing girl. That is the cutest work out outfit. I love the jacket! How cute are these leggings! I absolutely love the print! Are the bras pretty supportive? That's always important for me when I look for workout wear! I've been looking to add more 'fun' and stylish athleisure outfits to my wardrobe, especially since I work out 5x a week and sometimes I need to drop the kids off at school as I'm finishing up! This is SO cute, just love the matching leggings with the sporty top and that white jacket!!! Rachael, this is so adorable! I love the print. And the jacket is perfect. I love this workout outfit! You look amazing! How perfect is this! That coats adds the perfect layer to throw on over and go. So cute. This workout look is gorgeous! Love the set and that jacket is fantastic! Lady, you are in fantastic shape! Love that print too! Nice training clothes, I did not know the brand, I loved meeting. Girl you look amazing! This two piece workout gear is so stylish and looks amazing on you! I've never heard of Peach, but I'll definitely be checking it out! I would way rather have a fun print than basic black! You look so amazing! I hope you have a great weekend! Thanks for the linkup! Such a cool and chic look dear! So conveniently practical! I absolutely love the matching yoga and leggings! This is honestly one of the cutest workout outfits that I think I've ever seen. I love it! These workout pieces are super cute! I love the print! Having great workout clothing is always a great motivator for me! Good to know about Peach for next time my workout gear needs a refresh! This workout gear is the cutest! Nice blog post ! Love the new blogging confession and your outfit ! I really love this combination! Looking fantastic!